Delivered by McMullen & Wing in 2010, Big Fish is powered by twin Caterpillar engines, with a top speed of 16 knots and a range of 10,000 nautical miles. Accommodation is for 10 guests in five cabins including a master suite with floor to ceiling windows and a private deck area, and all cabins have full en suite facilities. A unique feature to Big Fish is that all her exterior decks have epoxy-infused granite, meaning that high heels are welcome. Furthermore, opening port and starboard stern bulwarks create the widest swim platform of any yacht under 65 metres, making it the perfect spot to while away the hours. A huge array of toys includes a kitesurfer, game fishing equipment, underwater camera and a decompression chamber. 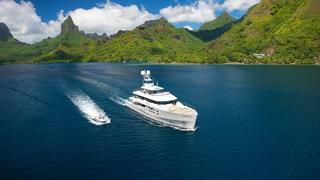 Charter rates on Big Fish are $275,000 per week in high season and $245,000 per week in low season through Y.CO.